It's your body, your baby and your birth - simple! The Simple Birth Company has partnered with B.A.B.I.E.S to provide a “Be Ready for Birth and Baby” Course which is an all inclusive antenatal package that provides you with the best birth and baby parent education around! 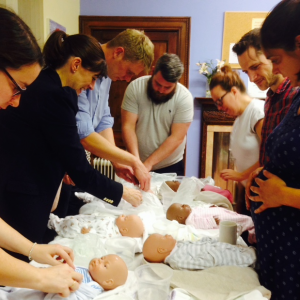 8 weeks of antenatal education, instruction and guidance for just £315 (usually £410)! This 4-week hypnobirthing course by The Simple Birth Company is designed to support you on your individual birthing journey no matter what type of birth you want, wish, plan or need to have. You will learn deep relaxation and breathing techniques to support you through pregnancy and birth with The Simple Birth Company’s Mind, Body & Soul Hypnobirthing Programme (click here to view course content or click here to view class dates). B.A.B.I.E.S very own “Be Ready for Baby” antenatal baby care course is 10 hours of instruction over a 4 week period covering ALL you need to know about looking after a baby, including shopping lists and what to do with your baby.